Walking is a fun and easy way of exercising and is likewise a lovely recreational activity. As with any other sport, the right gear for the job is required. Walking however casual, or brisk has some impact on your feet, and therefore a cushioned and comfortable walking shoe that is lightweight and breathable can be your best confederate. Brisk walking regularly is labeled as a moderate intensity aerobic exercise that raises your heart rate just enough to reduce health risks. Brisk and fast-paced Walking aids in building your overall aerobic fitness up to any intensity that is suitable for your workout. Although controlling what you eat has the greatest impact when it comes to weight control, walking can similarly help to keep off those extra pounds. Walking is an easy exercise to start off with particularly when you are overweight or unfit. Other than that, walking is a physical activity that can be enjoyed and practiced at any speed, with the same cardiovascular intensity as any moderate cardio work out. Walking can be compared to walking on the treadmill and even cycling when it comes to cardio exercises. To top it off, walking is fun, requires no special equipment, its free, and you get to enjoy fresh air and lovely scenery. The answer here is very simple, the lighter the shoe, the faster and easier you can walk. A lightweight walking shoe is particularly beneficial to beginner’s walkers who are still a bit unfit. A lightweight walking shoe will similarly prevent foot fatigue and keep you energized for much longer. Wearing shoes that are comfortable, supportive and that fit you well is a start to preventing injuries, calluses, and blisters. All the same, a walking shoe needs to be lightweight and to provide good shock absorption. A snug fit around the heel to protect your Achilles tendon, with a padded heel collar. Breathable and lightweight uppers from a mesh or textile material with supportive leather overlays. A cushioned and arch supportive insole that is lightweight and comfortable. A moisture-wicking lining, antimicrobial treatment is optional. A Gel Foam or Air midsole for shock absorption. A durable outsole with grooves or a patterned tread for traction. The WW577 from New Balance is one of their most popular walking shoes, this model ideally manufactured for women. This is a comfortable, durable and lightweight walking shoe, available in three basic and neutral color options. Pure and durable leather uppers in a Bone, White or black color options. The rubber sole is durable and provides excellent traction. Hook and loop strap closure with double Velcro straps, and a comfortably padded tongue and collar. Features the ever popular ABZORB cushioning system for the best in shock absorbency and cushioned comfort. Similarly sports the Strike Path outsole with flex grooves for better stability and flexible movement. Asics is a brand well known when it comes to sports and athletic shoes and gear. You can trust Asics for comfort, durability and high-quality performance, they have not failed in this regard, and manufacture some of the best walking and running shoes out there. The Gel Quickwalk is designed specifically to be lightweight and supportive for all walks of life!. Synthetic leather and mesh uppers for optimal breathability and a lightweight fit. A highly durable, high traction and abrasion resistant AHAR rubber outsole. Features Gel rear foot cushioning, that attenuates shock and allows for smoother transitioning when walking. Available in two feminine and neutral color options to choose from. A breathable and moisture wicking lining on the inside for further comfort. In need of a little orthopedic assistance, then look no further than this stunning and lightweight Walking shoe offered by the very popular, Vionic. Soft and comfortable leather uppers that are lightweight and breathable, with mesh inserts. There is a removable textile EVA footbed that ensures cushioning and smooth heel-to-toe transition. The outsole is rubber for better traction and durability. Comes with an AMA seal of acceptance, for its featured orthotic design. The orthotic design features an Active Motion System, with a flexible and cushioned sole. I am a huge Skechers fan, but I must say from an objective point of view, this little number is amazing as a walking shoe. 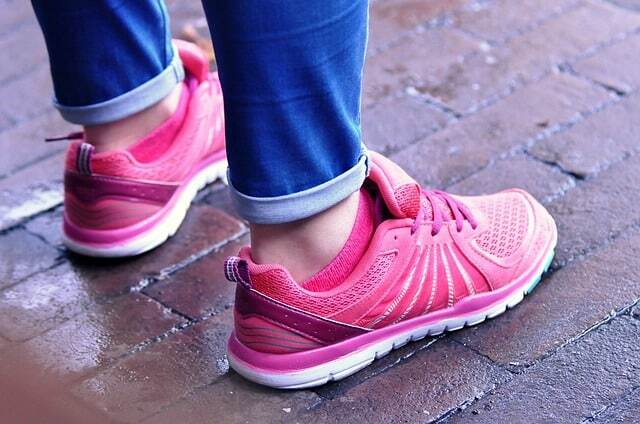 The Skechers Go Walk Kindle will keep your feet superbly cool and fresh, and completely diminish foot fatigue. Perfect for summer as a quick slip-on walking shoe. Let’s start with the uppers, 100% radically lightweight and breathable mesh, with a supple and flexible fit, that is virtually seamless. An easy slip on and slip off running shoe with the most lightweight design that you will find. Features the innovative and highly effective 5GEN midsole cushioning system. The Goga Max high rebound footbed returns energy to your feet with every step that you take, combatting foot fatigue in its tracks. The footbed is soft and comfortable lined with bamboo which is naturally anti-bacterial and odor resistant. Since most walking is done outdoors, here is one for the ladies who like a bit of rough and challenging outdoor terrains. The Brooks Cascadia is a lightweight running shoe designed to withstand the elements and provide the best grip on different and harsh outdoor surfaces. Ideal to use as both walking and running shoe. Offers neutral cushioning with a lightweight and flexible response. Highly Breathable, and Tightly knit Birdseye mesh uppers with an additional 3D print mud guarding overlay. The lace-up closure has a guard so that you can tuck away the laces to prevent trips and laces from coming undone. Features the very popular Gore-Tex waterproof lining that is well known for its exceptional breathability. A soft element fabric liner and removable comfort sock liner. The trail-specific sole has a pivot post system, with stabilizing suspension on both sides of the heel and forefoot. A BioMoGo midsole that offers exceptional cushioned comfort and support. The rubber throughout the outsole is HPR Plus and abrasion resistant for durability. Aggressive 3D Hex lugs on the tread offer optimal multi-directional grip. Do you like to feel the earth beneath your feet, well if you are one of those minimalist walkers like I am, you will thoroughly enjoy these hiking and trail running minimalist shoes. Offers extremely lightweight and flexible performance and comfort. Gives you that barefoot feeling with the FeelTrue designed rubber outsole. The tread has 4 mm lugs for incredible traction in dry and wet conditions. The natural movement that this shoe allows with its flexible design allows you to feel the world as you are supposed to. There is 6mm of FeelTrue rubber embedded with 3MM of BareFoam to fill out all the rough spots for a bit of support. A lightweight walking shoe can make a huge difference when it comes to foot fatigue and less pressure. The options that I have chosen all have some magnificent comfort and support features ideal for walking on different surfaces, while still remaining very lightweight.